Donald Downer is an Ophthalmologist with Clay Eye Physicians and Surgeons; a ten partner group focused on state of the art eye care serving northeastern Florida. Dr. Downer was an early adopter of Femtosecond laser for cataract surgery. Also, his group built a successful program partnering with Sightpath Medical. On the Cognified Marketing and Selling Podcast, Dr. Downer discusses his thoughts on how to add new services to a practice, the role of the patient questionnaire and the importance of staff buy-in with a femtosecond laser program. Listen to today’s episode to hear where Dr. Downer thinks femtosecond laser technology will be in five to ten years. Also, he responds to doctors who believe that the laser slows them down. There’s much more than that in this informative episode so click below to give a listen or get it on iTunes. Podcasts are an excellent way to stay up-to-date on topics of interest to you. The Cognified Marketing and Selling Podcast is for sales reps, marketers, doctors and anyone else who wants to sell and market smarter. <pre>Joel Gaslin: [00:19] Hey, everybody, welcome back to the Cognified Marketing and Selling Podcast. My guest today is Donald Downer, MD. 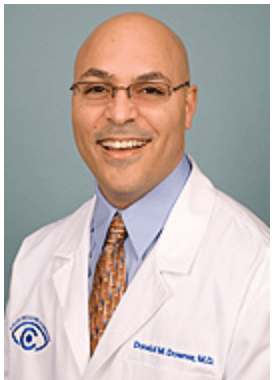 Don is a partner in Clay Eye Physicians &amp; Surgeons, a 10-physician group in Jacksonville, Florida. [00:32] Several years ago, Don and his partners introduced femto-laser-assisted cataract surgery into their practice. In this episode of Cognified Marketing and Selling, Don talks about how he and his partners did this, what steps they took to be successful, and other stories and tips along the way of things they’ve learned. Thanks a lot for stopping by, hope you enjoy the episode. [00:56] How did you begin your laser-assisted cataract surgery program in your practice, and how was the staff involved when you started that process? Donald Downer: [01:06] We started that program about three to four years ago now. The first thing we did was get our surgery schedulers and our technicians on board. Basically, before the technology was even present in our practice, we showed them videos. We discussed the technology with our staff. We started that way. [01:32] Shortly after that, once the laser was actually incorporated into our practice, we then took our surgery schedulers to the operating room so they could observe patients actually undergo laser-assisted cataract surgery. [01:45] We have 70 employees and, ultimately, we moved every employee through the operating room at some point during their training so that way everybody has been involved and can see the technology with their own eyes. [02:17] That really solidifies in the patient’s mind that laser cataract surgery would be beneficial to them. Joel: [02:23] In your experience, what did you see in terms of how did what they actually saw compared to what they believed they would see when they went over there to watch? Donald: [02:37] Many of our staff members have never been in an operating room before. You could argue that just being in the operating room was probably an impressive thing for them, but seeing the laser technology actually do the capsulotomy, make the incision, do the arcuates, they’re very, very impressed. Joel: [02:59] That’s an interesting take. Looking back, you’d maybe say that, as you move forward, you would probably have a part of new employees, they come in, they’re going to go spend time in the OR? That’s what I took from your comment. Donald: [03:14] Right. We’re always working and tweaking our tech training and staff training protocols. Part of that is to get a staff member into the office, and into the operating room, and see laser-assisted cataract surgery, because I really think that that’s a big part of helping the staff understand what they need to know and explain to patients when they’re asked questions and we’re not available. Joel: [03:42] In January, you did a presentation down at the Telling It Like It Is meeting in Naples, Florida. The title of your talk, which is wonderful, was “What are Patients Paying for with Laser-Assisted Cataract Surgery?” Will you please tell us a little bit about that? [04:10] Probably, the first and most important thing to think about is that patients are paying for laser LRIs. Plenty of practices in the past have had patients pay for manual LRIs. Do you want to be on this podcast? It’s easy, just click on this and pick a time! [04:23] I think that the most important thing is to understand that what patients are paying for, what CMS has allowed, is for femto-assisted laser arcuate incisions. That’s the first thing that patients are paying for. [04:35] Patients are also paying for the technology that you’re bringing into your practice to give them the best outcomes possible. That may include Pentacams, upgraded IOLMasters, LENSTARs. These are all technologies that are expensive. In order for us to give the patients the best refractive outcome, we like to use those technologies. [04:58] Patients are paying for that. We incorporate that into the fee that patients pay for. [05:06] The laser also does the incisions. It also does the capsulotomy. It also does the chop. Although that’s nice for me, and I think that makes the surgery easier for me, that’s not really something we can say that patients are paying for, as far as CMS goes. [05:24] I think it makes a big difference in my hands to do cataract surgery with the laser. It certainly makes things a lot easier. Joel: [05:29] Shifting over a little bit to in the practice, and I would almost call it market segmentation of patients, or even thinking about how to roll it out to a patient, what is the role and importance of the patient questionnaire in your laser cataract surgery program? Donald: [05:46] We have a questionnaire that’s pretty generic about cataracts in general, asking the patients if they’re having difficulty seeing at night and difficulty reading. It’s a standard questionnaire. We then have additional questionnaires that we used to use, but patients sometime fill them out, sometimes they don’t. [06:08] What a lot of the physicians in our practice will do is take the extra time to figure out is this patient a night driver? Does this patient depend heavily on reading? Is the patient coming in with glare and haloes? Because that helps drive the direction and the conversation a little bit. [06:27] We also talk to the patient about their options. We present it as one, two, three, four. That you can have laser-assisted cataract surgery with a multifocal implant, you can have laser with a torque, or you can have laser with a monofocal implant, or you can have the standard cataract surgery. [06:45] We go through those options with patients, and they tell us. Through a conversation of what they want, we sort of work through it that way. Joel: [06:54] You mentioned that you talk through them with their options. When is the first time or at what stage of the process do they hear about, “Hey, I’m going to have some options to think about for my cataract surgery”? Donald: [07:06] If a patient comes into our office who is seeing one of our non-operating MDs or one of our optometrists, they’ll oftentimes hear about laser technology before they’re sent over to the surgeon. [07:20] If they come to the practice and they’re referred from an outside optometrist, a lot of times we’ll try to get them information in their hands, either via mail or email, to briefly discuss that there is an option for laser. We’ll determine if you’re a good candidate when you come in for your pre-operative visit. [07:41] Those are some of the major things that we use. We’re not an optometrically heavy referral practice. A lot of our patients have been around for 30, 40 years. They’ve come in because of the name over these years. [07:54] A lot of patients will come in with blurry vision. Those patients, we don’t know do they need glasses, is it a cataract, do they have an epiretinal membrane. A lot of those patients will hear about laser cataract surgery for the first time at that moment. [08:08] At the same time, those patients have been coming to the practice for such a long time that they trust us with their care. When we go through the different options, they’re happy to discuss them and make decisions. Joel: [08:21] With these patients, it sounds like you have a long history in the practice and you have a large patient base that is coming in on a regular basis. [08:30] How do you communicate or stay in touch with these folks to try and cultivate referrals from them, knowing that roughly 55 to 60 percent of patients come from past patients? How do you do that? Donald: [08:42] Right now, probably our main driver is using the Internet and email. We’ll occasionally send out email blasts to patients on different topics, including cataract surgery, dry eye. That’s probably one of the main drivers. [09:02] Laser cataract surgery is really an easy conversation to have with patients because they’ve heard the term laser and eye surgery for such a long time with Lasik, and YAG lasers, and glaucoma lasers, and retina lasers. Usually, it’s really an easy conversation to have. [09:22] Most patients actually want the laser. They don’t all want to pay for the laser, [laughs] but they pretty much all want the laser. Joel: [09:29] How do you respond, Don, to physicians who say, “The laser slows me down”? Donald: [09:33] I would say that they need to visit a practice and see that it doesn’t. The laser may add an extra hour to an hour and a half, maybe two hours, tops, to an entire operating room day. [09:47] If you do 15 cataracts without a laser and you’re done at noon, but you do 15 cataracts with the laser and you’re done at 1:30, it took a little bit longer, but the doctor who did the 15 cataracts with 15 femtos did 30 procedures, and the doctor who did 15 cataracts without the femtos did 15 cataracts. [10:14] It does take a little bit longer, but you’re compensated for your time, so I don’t see it that way. Donald: [10:24] Cases per hour. Joel: [10:27] revenue per hour. How do you think about the market you serve in the Jacksonville area, in terms of size? How do you reach it, and what strategies do you use? [10:40] We talked a little bit about email. Anything else that we missed in that part of it? You have a marketing person who does that for you? How do you think about that? Donald: [10:49] We do have a marketing person, and she handles much of what we do. Probably the biggest thing is we’ve expanded from two offices to four offices, so we have a larger geographic coverage. We see a lot of patients. [11:07] Word of mouth has really been a big thing. Two of our offices are in almost rural parts of Jacksonville. When we started doing laser cataract surgery, the debate was could we even do 5 or 10 lasers a month as an entire practice. Now we do more like 10 to 20 lasers per operating surgeon per month. [11:38] All of us have been pleasantly surprised at the number of patients who actually want this technology. It almost markets itself. It’s hard to believe. [11:52] If somebody puts up a billboard, if you’ve been a patient of a practice for 20 years, they don’t just leave and go to another practice. They call your practice and say, “Do you offer the laser?” The answer is yes, we do. [12:05] They’re happy to hear it. They’re glad that you offer the latest technology. They don’t always choose it, but they want to know that they’re coming to a practice that offers the latest and greatest, and it’s staying up with the times. Joel: [12:18] That sounds great. What are your thoughts on the importance of having a family member or caregiver in the room during an evaluation and the discussion about cataract surgery? [12:57] A lot of times, a spouse or a son or daughter who have gone on YouTube or on the Internet and researched this, they want their family members to have the best technology and the best opportunity to see as clear as they possibly can. [13:15] I really think it’s a big part of conversion, whether it’s laser or multifocal torques. That whole package, having a family member there is critical. Joel: [13:26] What percent, roughly, of your patients do you think come in with some sort of research already done and have something in mind before they even walk in the door? Donald: [13:36] The number is pretty high. It’s probably 60 percent, 75 percent, somewhere in that range. If they have not done the research themself, their spouse, sibling, or one of their children has. Donald: [14:06] He basically moved the needle in that direction. That’s where family members are really helpful for some of the patients, to make these decisions. [14:17] When you have discussions about astigmatism, patients who’ve known they’ve had astigmatism their whole life, again, that discussion is pretty straightforward and pretty easy to have, but having a family member there to say, “Look, you haven’t seen well your whole life, now’s the time to go for it,” it really makes a big difference. Joel: [14:39] Because I’ve heard many people say that their process begins binary, that they say, “Look, do you want to wear glasses or don’t you?” If a patient responds one way or another, it takes them down the process. [14:53] I’ve also been struck by does it really have to be a binary procedure? Because it’s not just do you want to wear glasses or don’t you. It’s really more about how would life without glasses impact your life, or something like that. What do you think about that? [15:26] When patients make those kind of statements, and they have two units or two diopters of astigmatism, and then they have cataract surgery, they don’t understand why they still have to wear glasses when their friends don’t have to wear glasses. It’s really an important part of the conversation to have. [15:45] Again, it’s not everything. I’ve had plenty of patients say, “I want the laser because I want the best, and if I have to wear a little bit of glasses, that’s fine,” but cataract surgery can result in a significant amount of disappointment if patients are coming there thinking that they’re going to be out of glasses, and they didn’t really think through the whole process. [16:05] Those patients could be really time consuming, so it’s really important to have that discussion upfront. “We’re going to do this cataract surgery. We’re going to do the laser. Our goal is to get you out of glasses,” or it’s not. [16:16] Again, you can do the laser with maybe that that’s not necessarily the goal, but I think that that has to be discussed on the front end because most patients who come in for cataract surgery think that, after cataract surgery, there will be glasses or spectacle-free, or pretty close to it. Joel: [16:33] When you think back to when you were starting or considering getting into femto laser cataract surgery, how did you go about your process of thinking through and about how you get started? Donald: [16:46] In a larger practice, making these kinds of decisions are definitely more difficult than if you’re in a solo practice or maybe a two-person practice. It’s hard to convince a lot of the guys to want to go out there and spend $500,000 plus maintenance contracts, and all these things, to get a laser. [17:09] We had a couple guys in our office who were not against the laser, but were certainly against paying for one. [laughs] We had a couple guys in the practice who were really die-hard, wanted to have access to the laser because the technology was in town and we wanted to make sure we kept up with everybody else. [17:31] Ultimately, the happy medium was to go with Sightpath and do the roll-on, roll-off. That’s worked far better than any one of us could have imagined. Joel: [17:43] We’re grateful for that. I wasn’t looking for a plug there, but I’m grateful for it, so thank you. Where do you see the femtosecond laser in ophthalmology in 5 to 10 years, Don? Donald: [17:54] The units are going to get faster. The boxes are going to get smaller. The technology, the laser, is going to get better. [18:07] I think there’s going to be incorporation of ORA, or technologies like that, where you have some form of intraoperative aberrometry that is going to be better than what’s available today. I think the technology, pre-operatively, that takes into account the astigmatic effects and LRI, Nolograms, those are all going to be significantly improved. [18:31] I think it’s going to keep getting better and better. We’re still in the beginning phase of laser cataract surgery. Joel: [18:38] I’d agree with that. It’s going to be exciting, next 5 to 10 years. What have I not asked you about that perhaps you’d like to talk about when you think about your upgraded cataract surgery program? Donald: [18:55] There are some doctors out there who really love it. There are some out there who really don’t. I would encourage physicians to give it a shot for themselves, and see what they think. [19:13] In our practice, one of our most senior operating physicians wasn’t really for it. Now, he’s our highest volume femto cataract surgeon. [19:25] I think it’s really important that if you want to have an opinion on femto cataract surgery, try it first. If you believe that LRIs are beneficial to patients, femto LRIs are as good. I don’t think there’s any studies out there currently that say they’re better than manuals, but many residents these days don’t even get trained on how to manual LRIs. [19:53] I think that that’s where femto has been great. We have a lot of general ophthalmologists who never did LRIs, or did very few, who now have access to very accurate LRIs. [20:04] I think that that’s the big thing is, if you’re unsure about the technology, you can certainly give it a try and it wouldn’t cost you or your patients very much to do that. Do an evaluation for yourself. I think that would be an important thing to keep in mind. Joel: [20:21] I’m certainly grateful to have you on the podcast with me. It’s always a pleasure to visit with you. As a closing question, if you were going to be anything other than a doctor, what would you be, and why? Donald: [20:35] [laughs] I don’t know. Anything other than a doctor? Probably a pilot. I grew up with a significant love for airplanes and flying model airplanes, considered the military at one point. [20:55] I have three flight surgeons as partners, so we oftentimes will hear all the good, old stories of the military. Maybe a pilot, flight surgeon. Joel: [21:08] Have they told you stories about landing on aircraft carriers, and all that sort of stuff? Donald: [21:13] Yeah, they’ve told me some of the stories. Some of them I’m glad I wasn’t there. Donald: [21:19] Or hanging from a rope over a nuclear sub as you have to bring up an injured person. There are definitely some stories there, for sure. Joel: [21:27] That’s good. Don, thanks a lot for being on the Cognified Marketing and Selling Podcast. Appreciate your time. Grateful for your efforts and for the tips that you provided for the listeners. [21:38] To listeners, thanks a lot for being here. Look forward to next time. As always, you can find us at cognifiedmarketing.com or visit me on my blog at joelgaslin.com for all sorts of different things that I write about on there. [21:51] Thanks, have a great day. Look forward to next time.